These books provide all the information you need to produce your own Kombucha. They all contain complete growing instructions except for the one by Rosina Fasching which concentrates on using Kombucha to treat metabolic diseases including cancer and the book by Michael Roussin that is on Kombucha analysis. It is hard to recommend a particular book over the others. They are all by wonderful, caring, health-minded people. Click on the thumbnail images below to see larger images. The book is available in many places. For details on where to buy it, see Guenther's Web page, where to buy the book. He also has a Web page containing the index of the book. Guenther's book is an excellent book that is the result of many years of studying Kombucha. This book is the original source of much of the current information on Kombucha. Guenther is German. He is active on the Kombucha Mailing list, so it is possible to ask him questions. He operates The Kombucha Journal - Web Site. His Web site provides information about kombucha in several different languages. It is in Germany and tends to be somewhat slow from the USA due to the large amount of graphics on his pages and probably because of the long-distance Internet connections. Price $12.95 plus $2.25 shipping for the first book plus $0.50 handling for each additional book. If you live in California, also include sales tax. Send check or money order payable to Andra Malczewski and include your name, address, and phone. Andra's book is well written with complete step-by-step instructions illustrated with many photographs. It covers the essentials without making you do a lot of detailed reading. This a good book with lots of depth. Harald, born in Bavaria, is a medical herbalist living and practicing in Australia. He has a 5-acre medicinal herb nursery in Australia from which he supplies a variety of herbal teas, oils and ointments. Published by Gateway Books, an imprint of Gill & Macmillan of Dublin, Ireland. Available, price $14.95, through Bookpeople (800 999 4650), New Leaf, (800 326 2665), and from The Kombucha Tea Network uk. The Bartholomews are founders of The Kombucha Tea Network uk. In addition to their own research, they have used extensive feedback from their Network. This user-friendly guide includes an exhaustive Q & A section, an A-Z of illnesses treatable with Kombucha, in depth case histories and dozens of applications. They introduce the concept of ‘Kombucha Therapy’. This book has been out about a year but I have just been made aware of it. It is intended to be a book that can be used as a common point with your allopathic physician. Published by Sierra Sunrise Publishing, Inc., 14622 Ventura Boulevard, Suite 800, Sherman Oaks, CA 91403. Betsy Pryor is the president of Laurel Farms, a major Kombucha supplier. The cover graphic (to the left) is for the first edition. See the Laurel Farms Web Site for current information on Betsy Pryor's books. By Christopher Hobbs, L. Ac. Cover Price $6.95. Available in California health food stores. Christopher goes into detail about the yeasts and fungus elements of the Kombucha mushroom and provides a cautionary approach to the health claims surrounding Kombucha. Christopher is a fourth generation herbalist and botanist with over 20 years experience. He has written several herb books and is a consultant to the herb industry. Published by W. Ennsthaler, A-4402 Steyr, 1995. Availability: This book is out of print, I include it to make the reader aware of it. It may be available at your library. Rosina concentrates on the use of Kombucha to treat metabolic diseases including cancer. This book does not cover how to make the beverage. This video covers Kombucha preparation, history, medical information, and testimonials. It is not as deep as the books but it covers the essentials very well. For the visually oriented, this is the way to go. You can quickly learn how to make the Kombucha from this video. It presents the Kombucha highlights. It's a good way to inform someone about Kombucha that does not want to sit down and read a book. But if you really want to understand the how and whys of Kombucha, you still need to read a book or read the pages on this Kombucha Web site. This is what Brenda Roberts says about her video: "Shot in the beautiful Pacific Northwest, Kombucha Tea, A Celestial Gift is the definitive guide to the proper preparation of the mushroom tea. The video features Norman Baker, who has has been instrumental in sharing Kombucha freely with those who are seriously ill. Norman details the correct 'step-by-step' method of preparing the tea, and also shares his own personal healing story of recovery from being a quadriplegic. Featuring spectacular footage of the Puget Sound, and specially composed music, Kombucha Tea, A Celestial Gift is a treat to watch. One third of the proceeds from the sale of this video goes to freely distribute the mushroom/tea starter kit to those who cannot afford it." 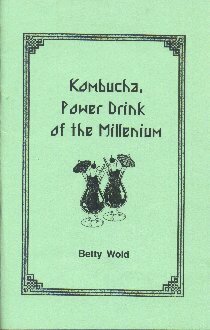 Sometime ago I published a Kombucha booklet booklet (33 pages) which I sold for $5.00 including p/h. I wrote it for my friends--not as a scientific treatise but just to answer their questions and allay their fears. About Betty: Betty Wold, herb grower, author, lecturer and teacher has been growing herbs for more years than she cares to admit. She has been a featured speaker at the International Herb Growers and Marketers Association Convention, Great Lakes Herb Federation, New Zealand Herb Federation Conference and many regional herb meetings. She is a member of the Oklahoma Herb Growers and Marketers Association and several local herb groups. Her insatiable curiosity leads her to explore anything having to do with herbs and alternative health care. This booklet is the result. Betty has included about 25 recipes for Kombucha. The book is worth $5.00 just for the recipes. Well written but some of the information is dated. Email Betty for details. Kombucha is not a product that drug companies can patent so they are not very interested in doing expensive research on Kombucha. We are fortunate that Michael Roussin has done this research. His work is highly regarded by Kombucha experts in the Kombucha Internet Community. You can find out more about their findings from the more than 1,000 Kombucha samples they analyzed in his book by visiting his Kombucha Research Web Site.